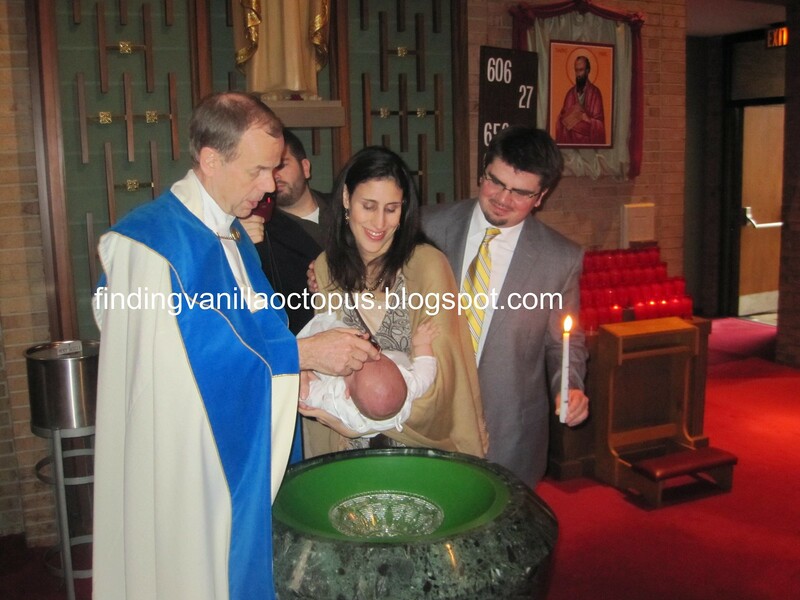 Abigail Rose was baptized on March 6th, 2011, at St. Catherine Laboure Catholic Church in Wheaton, MD. It is the parish that I belonged to throughout much of my childhood, up until I moved to Northern Virginia a few years ago. I sang in the choir there for many years, and developed a close friendship with Father Morrow, one of the parish priests (and Parochial Vicar). 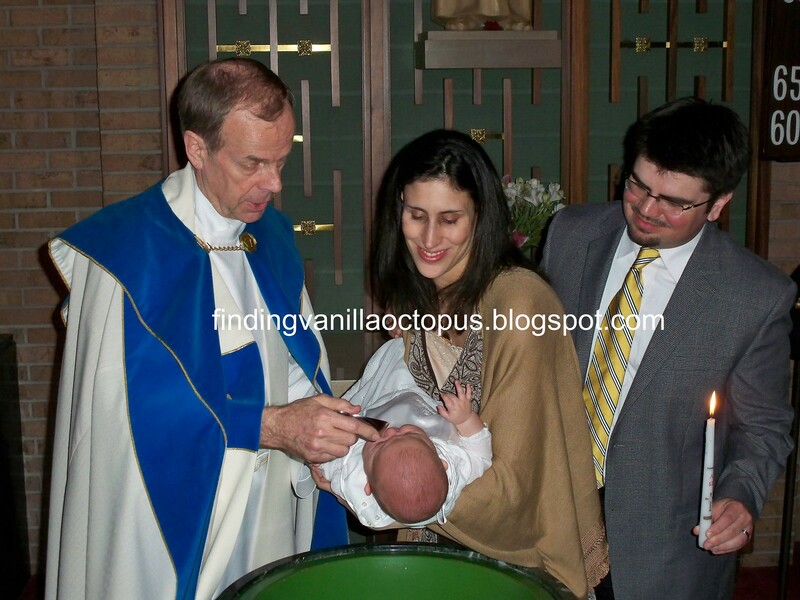 He was my Spiritual Director for about a year, and was my first choice for the priest who would marry Tom and me, but he was not available on the day that we chose. 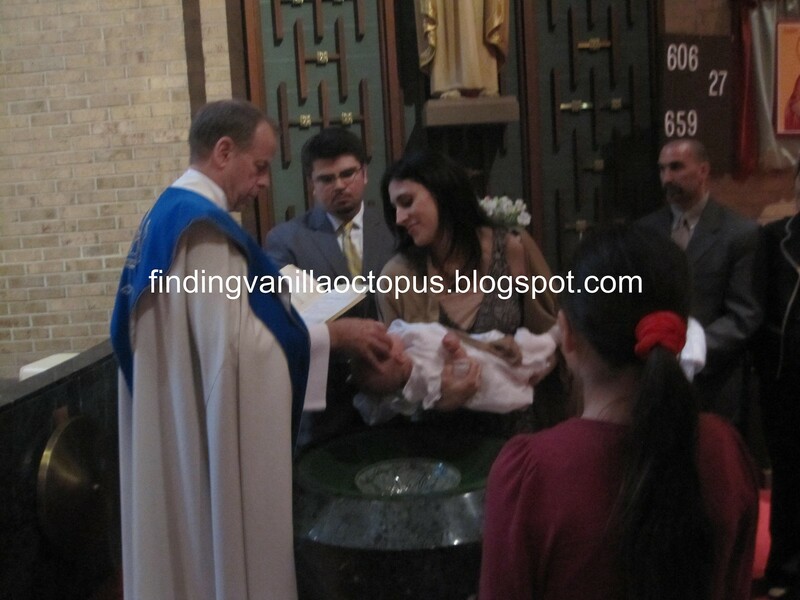 So, I wanted to make certain that he would be the priest to baptize my first child. 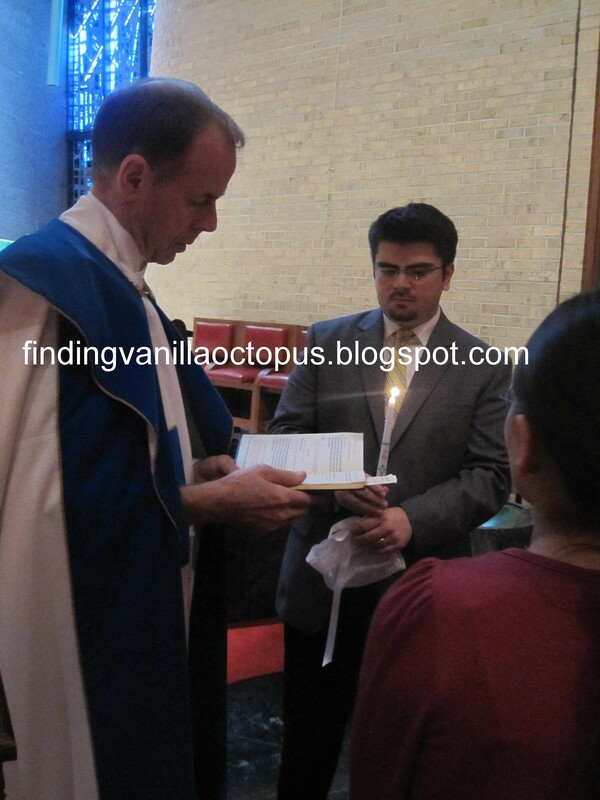 It was a private ceremony on a Sunday afternoon, after the last of the morning Masses. 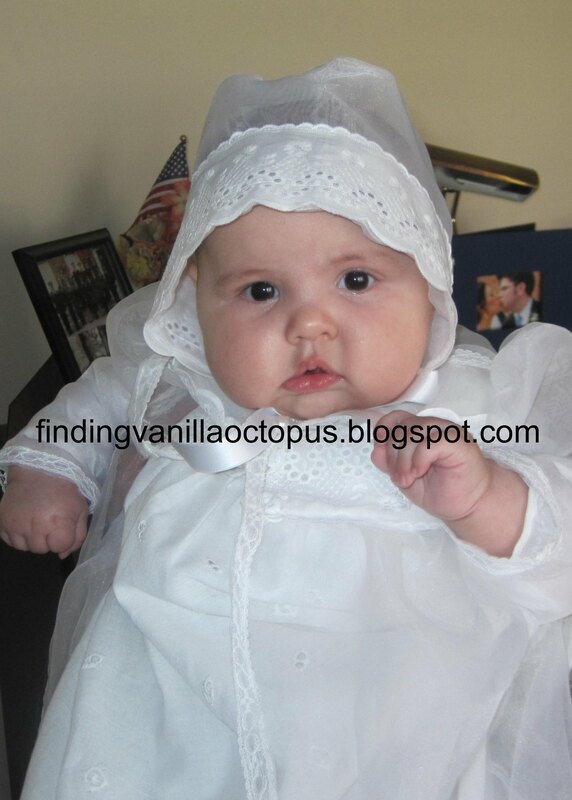 I remember that it rained that day, and I had to run quickly from the street to the church doors with Abby's carrier in my arms upon our arrival. 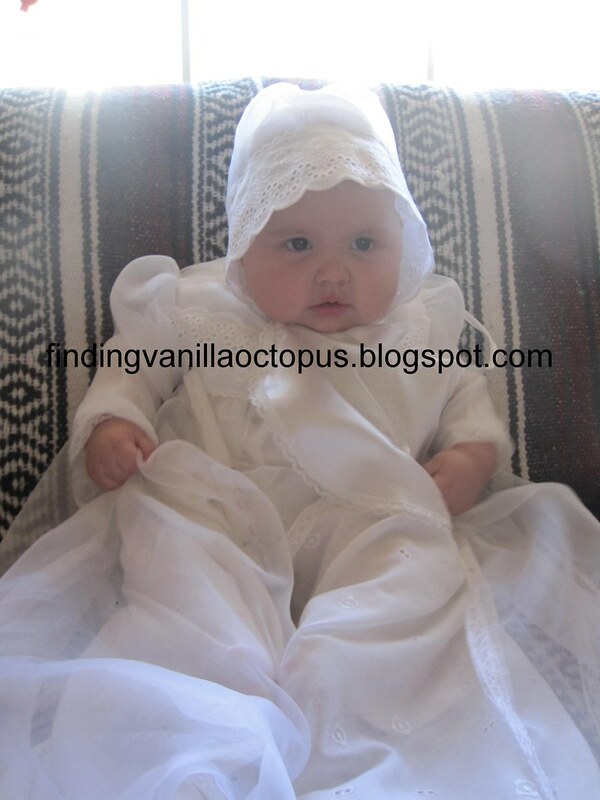 Abby wore the same gown that I wore, many years ago, made by my paternal grandmother. 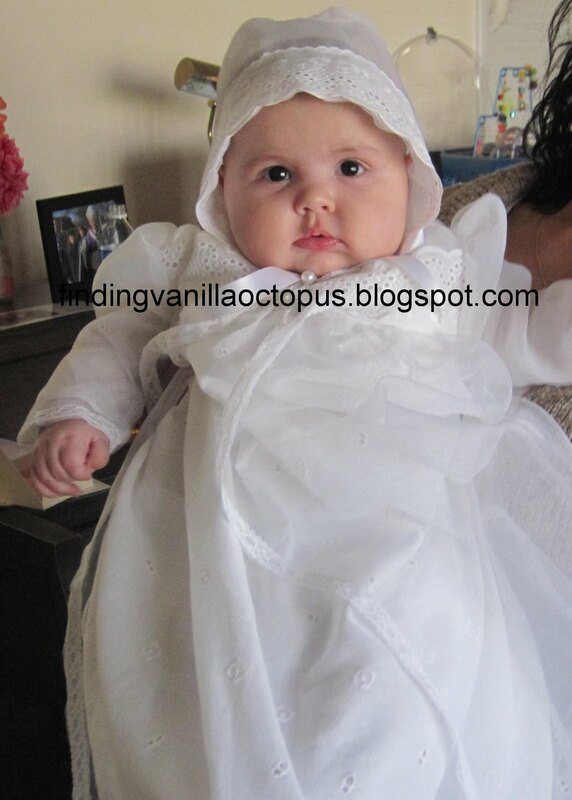 Over-top of that, she wore an over-gown and bonnet, handmade by Mima. A very special outfit, indeed. 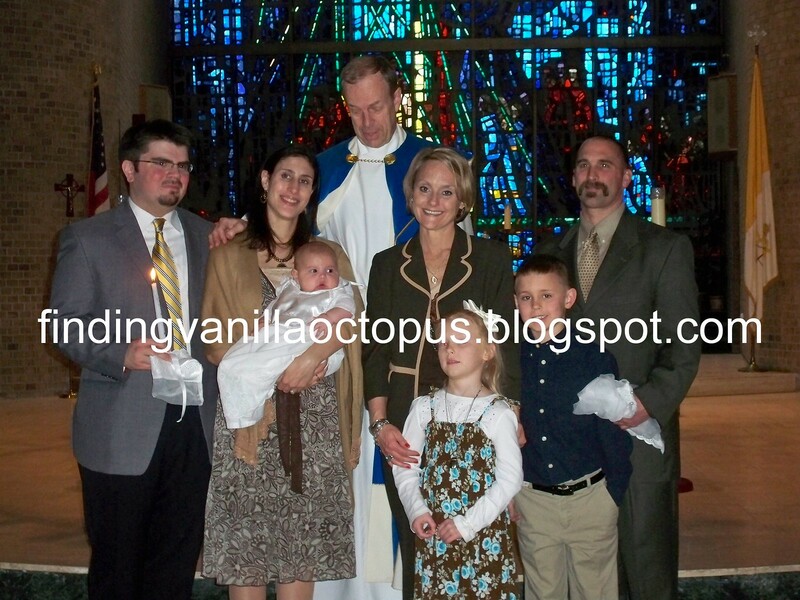 We had a small gathering of family and friends in attendance, including four children. 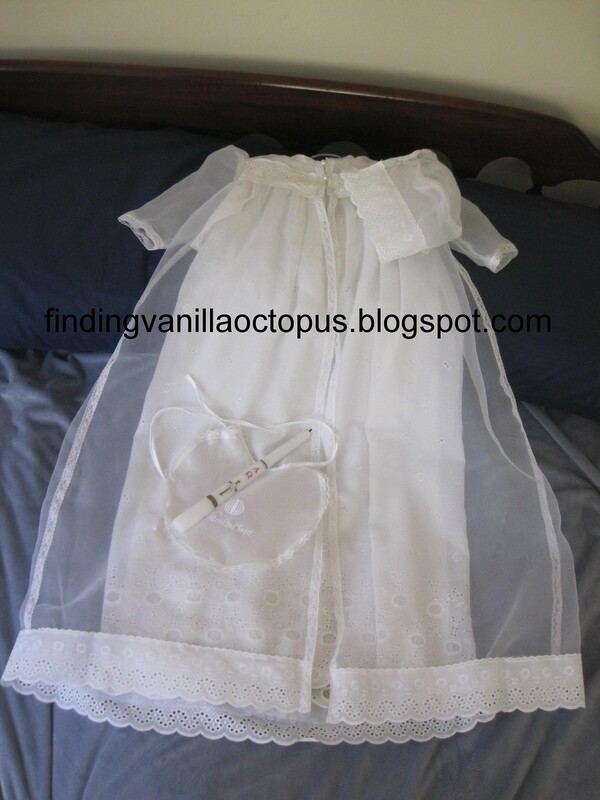 Two were the children of Abby's godparents, and two, the children of my best friend, Lexi. 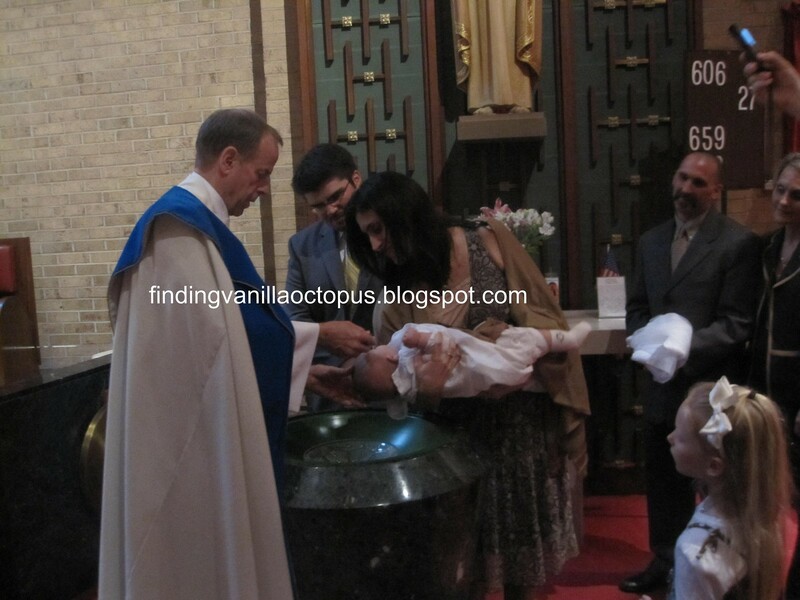 I was delighted when Father Morrow involved them closely in the various parts of the baptism, assigning tasks like handing him the water bowl and oil when the time came for him to use them. Cuddles and soothing with Mommy. 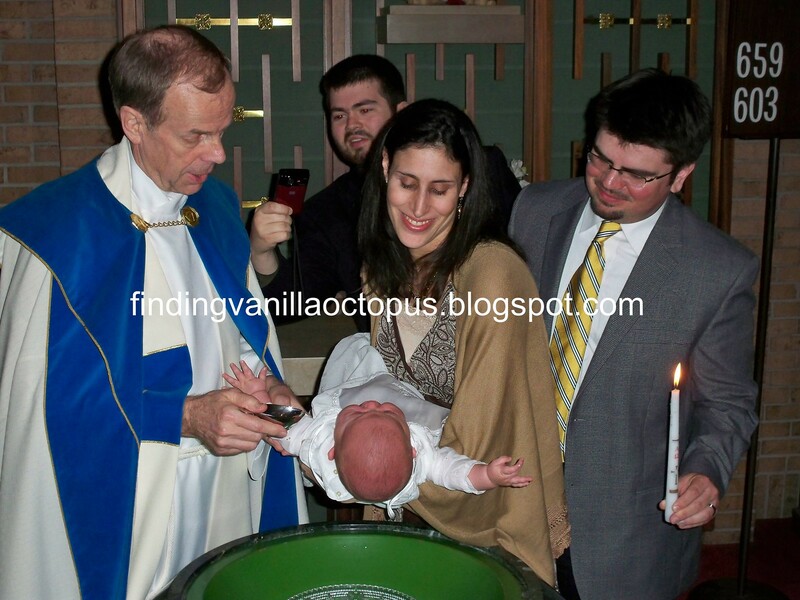 Lighting of the Baptismal Candle. Abby did pretty well through most of it. I did have to remove her over-gown shortly after our arrival, as she was quickly becoming too warm. She wasn't a fan of the water or oil, but calmed down easily once back in my arms. We did have intermittent fussing during the picture-taking afterwards. Like during some of these staged shots (re-enacted so that we would have a chance to capture them with use of a flash). Group shot with the grandparents (maternal on left, paternal on right), and, of course, Father Morrow. 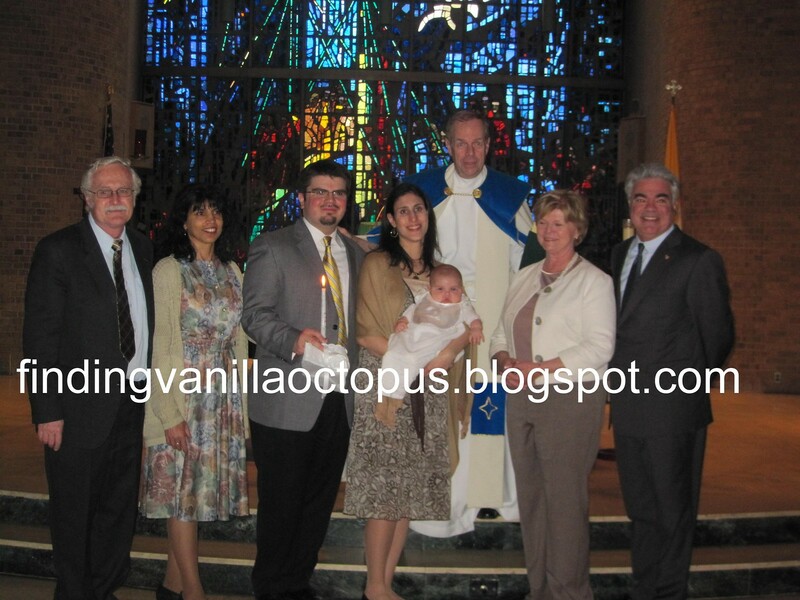 Group shot with the lovely Godparents, Kelly and Mike, and their beautiful children. And a good time was had by all afterwards at my parents' home. 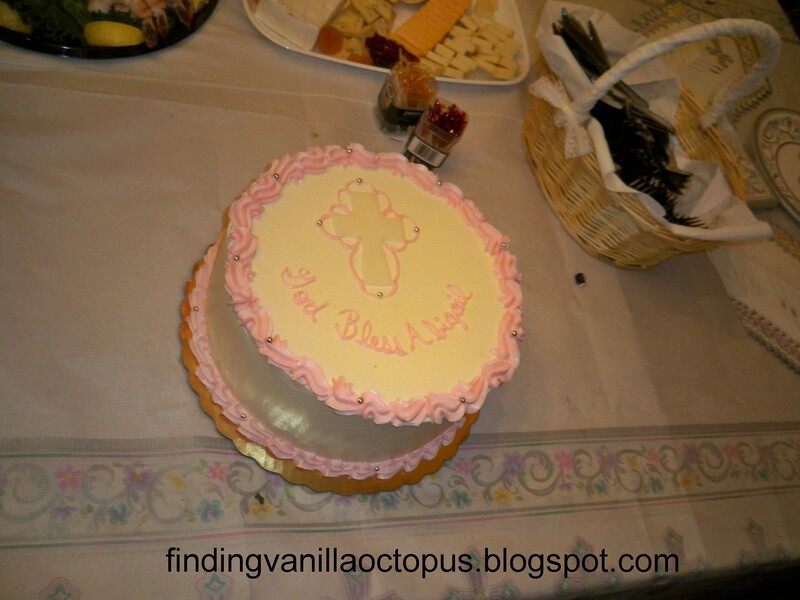 We ordered a cake for Abby from the same bakery that made our wedding cake, a little shop called Cake Dreams in Rockville, MD. We even got it in the same flavor that we chose for our wedding cake: alternating layers of chocolate and yellow cake with caramel filling. Yum! It was quite a thrill to be able to sit and enjoy my slice- I'd been too busy running around on my wedding day to do so then. Abigail, exhausted by the days events, took advantage of visiting family to take a long-deserved nap amidst the party-going. And here are some pictures of the princess, all dolled up, taken by my mother about a week later (we had no time on the day of). I love that the front cover of one of Tom's and my wedding albums ended up in the background of this shot (over Abby's left shoulder). What a happy little family we made.